For October, the Educational Technology Debate will be focusing on ICT that can improve reading skills of learners in primary schools. 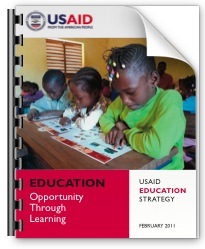 Our topic is influenced by the USAID Global Education Strategy, which has as it’s Goal One the improved reading skills for 100 million children in primary grades by 2015, via improved reading instruction, improved reading delivery systems, and greater engagement, accountability, and transparency by communities and the public. Studies have also shown that learning outcomes have a direct correlation to a country’s economic growth. A 10% increase in the share of students reaching basic literacy translates into a 0.3 percentage point higher annual growth rate for that country. Other research has shown that early grade reading competency is critical for continued retention and success in future grades. This link is especially relevant for low­-income children, because they tend to have home and school environments that are less conducive to early reading development relative to those of higher income children. Children who do not attain reading skills at the primary level are on a lifetime trajectory of limited educational progress and therefore limited economic and developmental opportunity. Given limited resources, USAID believes the most strategic impact it can make in basic education is to address early grade reading as an outcome that is critical to sustain and ensure learning for children. While the conversation will not be bound to this specific organization or these explicit goals, we will have thought leaders sharing their learned opinion on what information and communication technology could best be used to reach a goal like this – improve reading skills of learners in primary schools. For those that are in the USAID sphere, this topic is very timely. USAID/Ethiopia will be issuing a Reading for Ethiopia’s Achievement Developed (READ) Technical Assistance RFP this fall and technology interventions to improve reading figure very prominently in the draft RFP. Subscribe now and get Educational Technology Debate sent directly to your inbox. « The eWaste of Development: What are the consequences of new technologies on the environment, and how can we act responsibly, starting now? Written by Wayan Vota on October 3, 2011 in Reading Skills in Primary Schools. Then you will be very pleased to know that USAID plans to issue a Grand Challenge for Development focused on empowering reading. Rumor has it that the Challenge will be issued soon, be in the millions, and highlight the use of ICT. Yet another reason this discussion is so timely. I couldn't find the link to the appendix 2 mentioned in the RFP for countries of eligibility, please could you provide it? I do not have any more information than what is posted by USAID. That said, they have just issued a modification that says it provides "Additional Information on Eligibility" for clarification on page 11 of the RFA document. True that kids enjoy audio visuals, but what are pedagogical approaches or systematic uses of A/V that can demonstrably improve reading and literacy? Just giving them Youtube isn't going to lead to better reading skills – in fact, TV watching is highly correlated with decreases in learning outcomes and what is Youtube but proletarian TV? I don't think 'giving them Youtub'e will produce authentic literacy improvements. I would say one of the the biggest pedagogical approaches in this space at the moment is digital storytelling, eg. http://www.springerlink.com/content/c668444443573…. Rather than kids consuming Youtube videos, they're creating them. This may not be the best strategy to directly impact a child's reading level, but literacy is not just reading. I think what they are looking for are not using Youtube kind of staff to get students to read. USAid is more likely trying to find new ideas on how to get those out of reach , say in remote areas to be able to learn read. How to be able to collect reliable data for such challenges.